I have been hearing a lot of talk about numbers lately, all of it related to the rapidly approaching camp and reunion season. Here are a two selected samples of conversations I have heard. Question: Why are you budgeting for reduced income? Are you expecting fewer people this year? Answer: Yes, as of now, we have significantly less people registered for the reunion. Question: How are registrations for the reunion looking? Answer: Good. As of today we have 197 people committed. People are requesting space in a certain dorm, and those rooms were all filled some time ago. We will have at least as many as last year if not more. An interesting contrast, isn’t it? But the really fascinating thing is that both of these conversations were about the same reunion, and the two discussions only occurred about a week apart! Everywhere I am hearing stories of things coming together, and registrations filling up. I think it is going to be a great summer for the camping season. 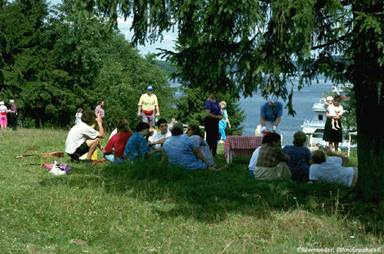 What is it about camps and reunions that makes people so interested? Why is it that people look forward to it and really want to be there? Is it the guest ministry? Is it the meals in the dining hall? The fellowship? The friendship? Is it because you get away from work, or computers, or phones? Is it because we can’t afford to fly to P.E.I. this year, but we can afford to go to camp? Is it the change of pace? Or is it because our lives were blessed there before, and we know they will be again? There are probably as many reasons as people, or perhaps as many ways of expressing the real reasons as there are people who will come. Whatever the reasons, I can tell that the level of anticipation is building. People are staking claim to their room or campsite, getting their kids registered for classes, and making sure they have the time booked off work. The level of excitement is growing. We can feel it. What about you; are you going to reunion this year? Are your kids or grandkids going to camp? Are you looking forward to the experience with anticipation? Are you excited? So, see you at the camp? and, as the director of that reunion i was so happy about that turn around in one week! amazing!